Bridging chapters are a flat circle. The Witcher Cycle, as I've argued before, is a grand subversion of fantasy tropes--and written before trope subversion became a trope in and of itself. Problem is, whereas Polish, Spanish, Russian and other readers have enjoyed these books for quite some time, English-language readers are just getting getting them now. That means we can only retroactively grant Sapkowski's epic the canonical status it deserves. Better late than never, though, at least as far as this reader is concerned, because this darkly humorous yet also deadly serious work of fiction, with its elliptically structured narrative that draws as much from Latin American magic realism as it does from Tolkein, is truly special. If you haven't guessed already, the Witcher Cycle is a fantasy epic with literary ambitions--or perhaps it's just literary by accident. Either way, it exists on a different plane from most of its fellow series--both in terms of quality and the challenge it presents to the reader. Even in that context, however, The Tower of Swallows is a difficult book to define, or even to recap. It is often disjointed, with stories told across several timelines and by multiple interlocutors. If often feels as if it is about to fall apart, until it finally manages to come together--with monumental effect. 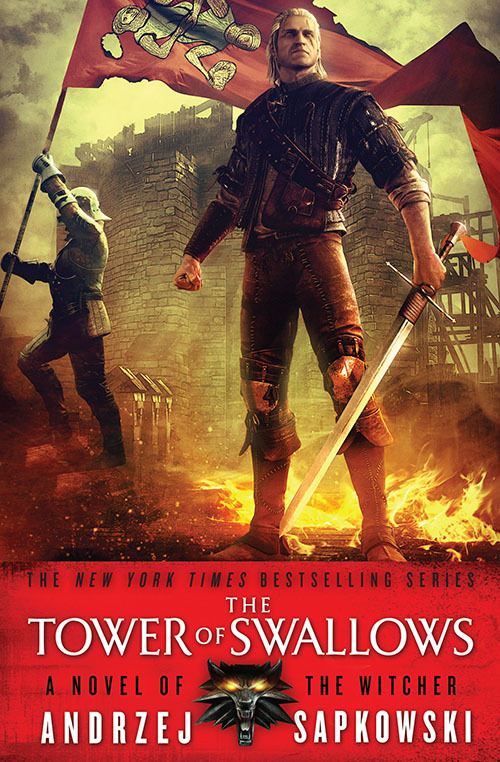 Of note, The Tower of Swallows isn't really about the eponymous witcher, Gerald of Rivia. He has his moments, but really this is Ciri's tale. It's also one of those tricky "get to Mordor" volumes that bedevil so many authors. Unsurprisingly, this is the weakest volume in the series so far. On the other hand, his is not Sapkowski's A Feast for Crows or A Dance with Dragons. There is clear direction here. Most real estate is devoted to Ciri telling the story of how she escaped Bonhart, a deeply menacing bounty hunter of unclear motivations; his erstwhile employer, Nilfgaardian coroner Stefan Skellen; and the Archmage Vilgefortz, who appears to be the series' Big Bad. Eventually she leaves her hiding place to make her way to the tower, followed by said pursuers, who are determined to catch her before she can enter the tower and reassume her powers. Geralt, Dandelion, Milva and Regis, meanwhile, are trying to make their way to Ciri, or to where they believes Ciri might be. Yennefer and Triss are also on Ciri's path, albeit on different timelines, and likely for different reasons. The character narratives contained within The Tower of Swallows are not always linear, or even told straightforwardly in the close third person favored by the genre. Yennefer's story, for example, is told over several timelines, with crucial parts related by individuals who may not be reliable narrators. More often than not, the stylistic gambit works, but there are instances in which The Tower of Swallows would have benefitted from more conventional plotting. For example, there is far too much space given to the spy Dijkstra's visit to a far-flung (and newly introduced) kingdom--a plot point that doesn't really develop and, frankly, isn't necessary. Meanwhile, several great characters from earlier volumes--Yennefer, Regis and Milva in particular--get too little screen time, so to speak. It's also worth noting that The Tower of Swallows, like its predecessor Baptism of Fire, is an extremely violent and at times disturbing read. You need to have a high tolerance for that kind of thing, but the violence is highly purposive. Political commentary is central to The Tower of Swallows, and Sapkowski is a clearly a keen observer of politics. Similarly, the series continues to satirize the questionable politics of traditional fantasy (something I commented on extensively in reviews of the last two books). These are, in my opinion, major points of strength--for the book and even more so for the series writ large. All in all this is a flawed volume in a superlative series, which makes it pretty good by my standard, but just short of excellent. Bonuses: +1 for experimenting with narrative structure; +1 for a picture perfect ending; +1 for Bonhart. Penalties: -1 for the digressions; -1 for not paying enough attention to good characters.